Its been a while since I had the chance to post a book review on the blog. I'm very excited about this book as it has the potential to impact so many families. 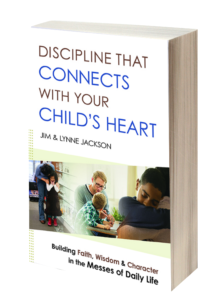 Discipline that Connects with Your Child's Heart by Jim and Lynne Jackson is a book that contains grace-filled parenting wisdom focused on discipline with connection. It culminates from the author's experience as parents, careers as professionals helping children of all types and the work of their ministry Connect Families that has touched so many families. Connected Families is a parenting ministry that has been impacting our family for a while now. I first became aware of Connected Families a year or two ago when they had a table at a large MOPS training event. 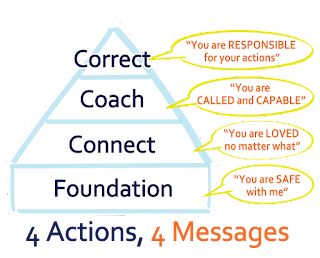 I ended up bringing home a magnet with the ministry's framework of core parenting messages (that are explained in the book) similar to the graphic below. I was drawn to how well the messages tied to what I hoped for my children and that it so succinctly addressed some of the parenting challenges of parenting children by birth and adoption at the same time. The magnet lived on my fridge where I could see it while I cooked and helped with homework during the crazy hour or two before supper (maybe its just here on the gravelly road, but so much parenting, conflict and crazy happens while I'm trying to cook supper). I found myself taking a deep breath and glancing at the magnet before I "ventured into the fray" of whatever conflict was suddenly becoming so loud. When it came in the mail, I immediately noticed the subtitle of this book: "Building Faith, Wisdom & Character in the Messes of Daily Life". Isn't that what all parents want? Its just hard to know how to get there. This book makes a big difference by providing a framework based on Biblical principles to planfully approach conflict and teaching moments from a perspective inline with faith-based and grace-based parenting goals, while also helping you connect to your child's heart instead of just quickly resolving the surface issue of the behavior or conflict. As I mentioned the book dives in the core parenting messages of "You are Safe with me", "You are LOVED no matter what", "You are Called and Capable", and "You are Responsible for your actions". There is a section covering each message with biblical wisdom, common parenting actions that can undermine the message, practical advice to put the message into action, and real life examples. Sections end with introspective questions to help you identify wisdom and advice you can begin to apply to your parenting. The book also includes a section at the end with wisdom for more specific challenges including sibling conflict, lying, daily routines, defiance, encouraging responsibility in kids and many more topics. I love the idea of the "kid connection" prompts with scripture, discussion and activities that were included throughout the book which could be used during a family meeting or after supper devotions to provide additional consistent teaching opportunities. I greatly appreciated the transparency and honesty the authors used by discussing the parenting challenges and issues that occurred in their own home. I found that their advice and wisdom came from a place of humility acknowledging that parenting is a journey with no quick fixes, helping the reader give themselves grace for past mistakes and encouraging them to try a different approach to make positive and lasting changes in their family. This is a book impacting our family here on the gravelly road that I hope can help many others as well. Right now this book is on sale at Amazon for a great price if you'd like to check it out!